Can Water Lettuce Be Kept Indoors During Winter? Home > Blog > Aquatic Plants > Can Water Lettuce Be Kept Indoors During Winter? Some pond owners wonder if it’s possible to bring water lettuce inside during the winter months, placing them in an aquarium until the spring. This is one of those questions that don’t really have an answer that is clear cut. While technically you can, there are a number of things that should be taken into consideration. 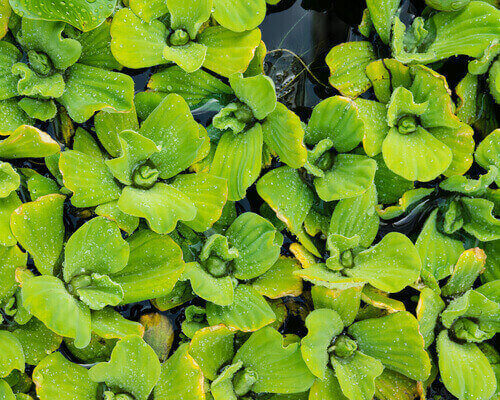 Water lettuce, also known as Pistia, is an aquatic plant. No one is certain of its exact origin, but it is believed to be pan tropical, which means it isn’t naturally found in places that have a cold climate. Its leaves are soft and thick and will typically have the shape of the rosette. When added to a pond or water garden it has a tendency to float along the surface and the roots are submersed below the leaves. The leaves can reach a length of 14 cm and will not have stems. Water lettuce has a lighter green color with margins that are wavy and veins that are parallel. This plant will usually be covered in small hairs which produce structures which are basket like and used to capture air bubbles, which are responsible for boosting the buoyancy of the plant. Its flowers are dioecious, which means that they are hidden in the plant’s center. When the plant is fertilized correctly, miniature green berries should appear. Water lettuce is quite popular in aquariums which are tropical as they can be used to provide coverage to fish, and it also competes with algae for water nutrients, which prevents the occurrence of algae blooms. Although water lettuce can be kept indoors when the weather turns cold, it is high maintenance to do so. For one, you will need lots of good lighting. The plant will also need a bit of clearance should it float to the top of the tank, and will not perform well if you attempt to press it beneath the lid so it is best for the aquarium to have top which is open. With these two things set in place the plant is likely to survive until spring. Additional steps that should be taken include storing the lettuce in a greenhouse enclosure which features shallow pools. The temperature in this environment should be warm, around 70 Fahrenheit or higher, as water lettuce prefers extensive sunlight. It is extremely important for pond owners to compost their water lettuce after first frost and purchase fresh water lettuce for the coming season. The reason for this is because water lettuce is one of the more affordable plants, and you may find that the cost of maintaining it indoors is much higher than simply replacing it. Many experts recommend using this plant as the annual within the pond, and then bringing them inside for to serve as a temporary plant feature once temperatures drop, or to compost them completely.